Kimono fashion often makes use of seasonal motifs, which is something that Japanese artist and Twitter user Kotetsu (@kotetsu_of) wanted to incorporate into his latest illustrations. 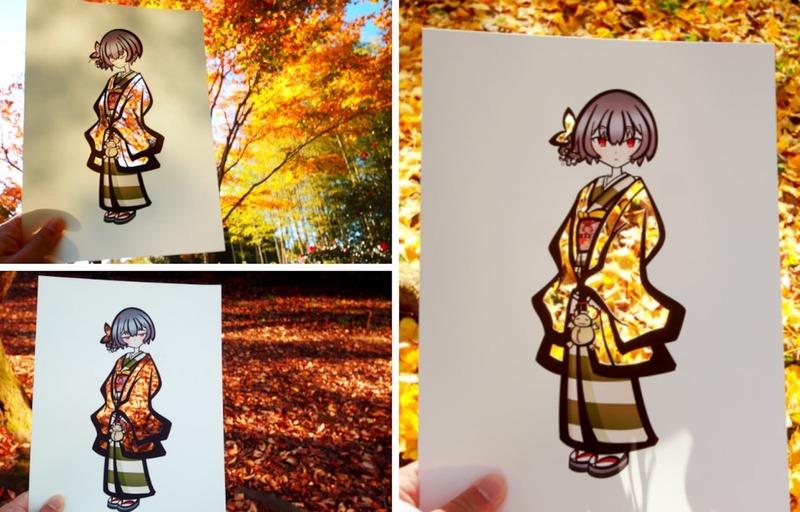 He’s done an incredible job, too, as he recently shared a series of snapshots of a cute lass with a bob cut posing demurely while dressed in a dazzling series of kimono decorated with maple, maidenhair and other autumn patterns. These aren’t just any ordinary illustrations. They’re inventive examples of kirie. Literally translating as “cut pictures,” kirie artists often start with a piece of colored paper and strategically cut away everything they don’t want colored in for the final image. However, Kotetsu’s hybrid illustration/kirie artwork starts with plain white paper, and he does do a little bit of conventional coloring, which you can see in the character’s hair, skin tone, inner kimono, sash and sandals. But by cutting away large sections of the character’s ensemble, he can use the hues of the physical world beyond the paper for a uniquely vibrant detail and captivating surrealism that would be impossible to achieve any other way. Since the scenery and lighting conditions are providing the coloring for the see-through sections, Kotetsu’s art requires not only illustration and kirie techniques, but photography ones as well, and each image is truly a one-of-kind artistic moment that can never be duplicated. The process works great for Western-style fashions too. Kotetsu snapped his photos of the kirie kimono girl at Showa Memorial Park in Tokyo, but it won’t be long before winter sets in and the leaves fall from the trees in Tokyo. However, that doesn’t mean we won’t see any more of amazing photos like this until next year, since amazing results can also be produced by using the blue sky or sunset as a background.